Own Assassins Creed - Assassins Mug from Deff, DVD, Blu-Ray & 4K Video Specialists - Free UK Delivery..
Own Assassins Creed - Logo Mug from Deff, DVD, Blu-Ray & 4K Video Specialists - Free UK Delivery..
Own Assassins Creed - Run Mug from Deff, DVD, Blu-Ray & 4K Video Specialists - Free UK Delivery..
Michael Fassbender and Marion Cotillard star in this action-adventure film based on the critically acclaimed video game franchise. Through a technology that unlocks his memories, Callum (Fassbender) discovers he is a descendant of an ancient line of Assassins. Bring home this "beautiful cinematic experience that transcends its video origins in every way." Special Features Take The Pledge: Behind The Scenes Of Assassin's Creed Five-Part..
Michael Fassbender and Marion Cotillard star in this action-adventure film based on the critically acclaimed video game franchise. Through a technology that unlocks his memories, Callum (Fassbender) discovers he is a descendant of an ancient line of Assassins. Bring home this "beautiful cinematic experience that transcends its video origins in every way." 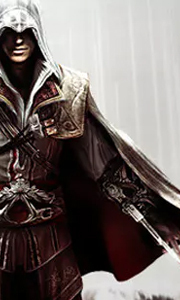 Special Features Assassin's Creed In High Definition, Take The Pledge: Behind The..